As 2014 winds down, let’s look back on the year that was in downtown Phoenix. 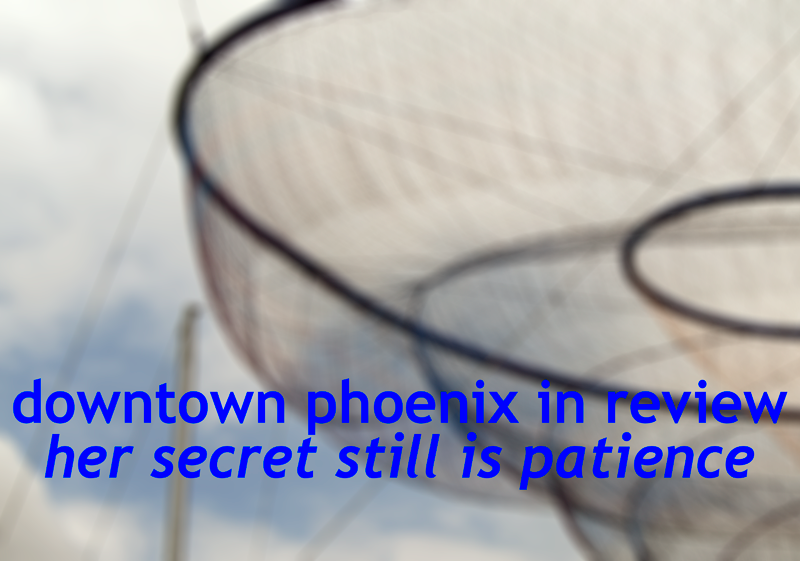 In this first post of four, I’ll look at downtown Phoenix’s strengths. 1. Hance Park Master Plan reveal. One of the big urban events in 2014 was the unveiling of the Hance Park Master Plan in March. The new Hance Park Master Plan makes a statement for urban public space in Phoenix. NYC-based !melk (led by Jerry van Eyck) worked with of Scottsdale-based Weddle Gilmore and Phoenix-based Floor Associates to create a fantastic plan for the 32.5-acre urban space. The Hance Park Conservancy, Phoenix’s first conservancy dedicated to a specific park, is now working to coordinate the $118 million fundraising project to translate paper to reality. Parks and public space are an integral part of the urban experience and this opportunity to create a defining urban space in Phoenix is an opportunity that we cannot let slip by. 2. Upgrades and maintenance at some of Phoenix’s best public art projects. Two of Phoenix’s best public art projects received major upgrades in 2014: Janet Echelman’s “Her Secret is Patience” at Civic Space Park received a new net and upgraded lighting in early December and two new artist-designed terrazzo floors at Phoenix Sky Harbor International Airport opened as part of the Terminal 3 SkyTrain expansion. The Airport’s terrazzo floors and the Echelman at Civic Space Park are, in my opinion, two of the nicest things that we have in this city and both show that we can do fantastic art projects in this city. 3. Music festivals in downtown Phoenix. March featured two big music festivals in downtown Phoenix: the VIVA PHX festival on March 7 and the McDowell Mountain Music Festival at the end of that month. Both festivals brought energy downtown and, most importantly, people. As I wrote in March right after the VIVA PHX festival, it seemed like downtown Phoenix was a “city in potentia.” The question is how can we keep that energy happening all the time? 4. Overwhelmingly unified opposition to SB 1062. In February, the Republican-led State Legislature passed Senate Bill 1062, a bill that would make it legal for individuals and businesses to deny services to others based on one’s religious beliefs, which is a thinly veiled assault on civil rights for everyone. Drafted by the anti-LGBTQ “Center for Arizona Policy,” the legislation would have unfairly targeted our LGBTQ friends, neighbors, and colleagues. After the bill was passed in the Arizona State Legislature, scores of Phoenix (and Arizona) chambers of commerce, community organizations, and elected bodies came out in near-unison against this damaging legislation. Governor Brewer ultimately vetoed the bill. 5. Groundbreaking of ASU’s Arizona Center for Law and Society. On 13 November, Arizona State University and its community partners broke ground on the new downtown Phoenix home of the ASU Sandra Day O’Connor College of Law, the Arizona Center for Law and Society. The building is set to open in time for the Fall 2016 semester and it will bring more development and density for downtown’s University District. Time will tell how open the building will remain to the public but I remain optimistic.